As of April 21st 2015 is being mobile friendly. Google is no longer indexing websites on cell phones that are not mobile friendly. They are not saying, well here's 70 percent website friendly, so you're 70 percent mobile friendly, so we’ll index you and maybe you’ll fix it later. It’s just a yes or no. This has been a really big change this year, and it’s really important to make sure that you pass the test. It’s important to understand that when we talk about mobile friendly as far as Google is concerned, and as far as your users are concerned, it’s not about whether you show up at all or not. 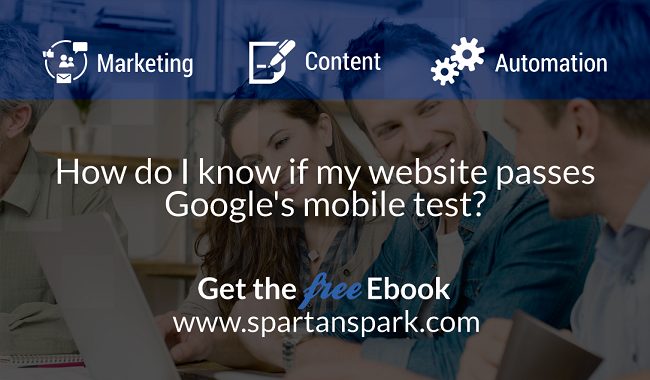 It’s whether your website is actually easy to use on a cell phone. If you’re using Adobe Flash, your website won’t show up at all on phone or tablets. Back in the day, we used to manually optimize websites, but now SpartanOne software is naturally optimized for mobile. We're cool like that. The other recent news, that we're delighted about is that on January 2017, Google will be penalizing websites with pop-ups because it provides a brutal user experience, especially on mobile. Find out more by reading Mashable's recent article. Wordpress started out as a great blogging platform, and blogs do really well with SEO because they’re constantly adding new and relevant content, but what happened over the years is that they have so many plug-ins to get to a current internet standard that Wordpress websites became super slow. The lag in loading web pages in no longer acceptable online, and especially on mobile. DID YOU KNOW: That for every second of lag you’re losing 20% of your audience! Ever Wonder What It Takes to Make A Great Logo? “Spartan Spark helped me take my site, that was already 7 months in development and basically re-build it in 7 weeks - and rocked!” -Mitch Solway - President, Single Parent Love Life Inc.
“Based on their outstanding work and great relationship we kept them on board to manage the day to day development and operations of the site.” -Mitch Solway - President, Single Parent Love Life Inc.
© 2011-2018 Spartan Spark Inc.